The following is by no means a “versus” article, it simply reflects my opinions gained through my relatively short experience in training in Judo and even shorter experience in training BJJ. As I have stated on numerous occasions, I consider myself a Judoka first but had I the time, money and a younger body (able to withstand multiple training sessions), I would train both arts but alas I do not. 1. 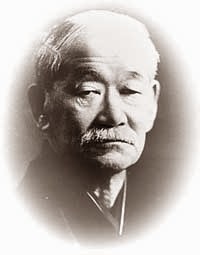 Lineage: Judo was developed in Japan by Jigoro Kano in the late 1800’s, as a variation of Jujitsu. Brazilian Jiu-Jitsu (BJJ) was developed and modified in Brazil by the Gracie family after having being taught Judo. 2. 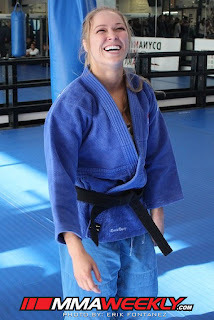 Uniform: Judoka wear heavy weave Gis tied by a belt with no undergarments (save underwear – hopefully); BJJ practitioners tend to wear a single weave and much lighter Gi that is tied by a belt. They also tend to wear funky tight fitting and shiny undergarments called rash guards that can be worn under the Gi. Furthermore, BJJ practitioners adorn and accessorize their Gis with color-coordinated patches and logos, usually representing clubs, affiliations and/or both. Lastly, BJJ can be practiced with a Gi or no-Gi; a big plus for those interested in MMA and Self-Defense. 3. Fighting Styles: Traditional Judo clubs focus on throws and takedowns which are scored accordingly in shiai (tournaments). For example, a perfect throw, one that demonstrates control, power and impetus can score a perfect point, the equivalent of a knockout punch. A perfect throw (Ippon) is the ultimate goal of most Judoka. One can also win on the ground via a submission (choke, arm lock) and/or hold down. Most Judo Clubs will focus 60-70 percent (or more) of their training on throws with the balance on ground work. Conversely, BJJ practitioners spend about 80-90 percent (or more) on the ground. Throws and takedowns are secondary and are scored as such. The ultimate goal in BJJ competition is a submission. 4. Tempo: For advanced BJJ competitors – blue to black belt – matches can run from 6 to 10 minutes with the majority of the contest taking placing on the ground/grappling. The average Judo match – for advanced and beginners – runs 5 minutes, with the majority of the contest taking place standing up. Unlike BJJ, if a Judo contest does go to the ground, fighters are given very little time to work a hold down or submission and if there is no immediate progression, fighters are quickly brought back to the standing position. A lull in action from either fighter results in penalties. As a result of shorter matches and penalties for inactivity, Judo fights tend to be faster paced and more frenetic. BJJ fights tend to have a slower tempo as fighters work on the ground to gain position, control and eventually, submissions. Extended durations may also result in a slower and more deliberate pace during BJJ matches, in large part to conserve energy and to set an opponent up for a submission. 5. Terminology: Steeped in Japanese tradition, Judo throws and techniques have Japanese origins and names. For example, the fireman’s carry (a common wrestling takedown) is known as ‘kata-guruma’ in Judo. Another common wrestling takedown – the double leg takedown – is known as ‘morote-gari’ in Judo. The rear naked choke is known as ‘hadaka jime.’ BJJ, on the other hand, has exotic and descriptive names that roll off the tongue and pique the imagination. For example, ‘peruvian neck tie,’ ‘omoplata,’ ‘nonoplata,’ ‘gogoplata’ and more. Other techniques have been anglicized and named so that the average person can easily visualize them, even those with no martial arts background. For example, the ‘guillotine choke,’ ‘clock choke,’ ‘collar choke,’ ‘spin around armbar,’ ‘guard to arm lock no gi.’ These terms, sound cool and are also used regularly by the likes of Joe Rogan when commentating on UFC fights. 6. Belt Gradings: Judoka begin at white belt and from there, progress to red, yellow, orange, green, blue, brown and eventually black belt. At each level, students are required to know a certain number of throws, hold downs, chokes, and arm locks to advance. For black belt, in addition to performing a certain number of throws, hold downs, chokes and arm locks, a Judoka must also compete and accumulate 100 points by entering tournaments and winning fights. They are awarded 10 points for each win via ippon, so that’s 10 wins via ippon. I’ve been told that an enthusiastic Judoka that practices 3-4 times per week and that competes should be able to attain their first degree black belt within 4-5 years. Like Judo, BJJ uses a belt grading system, but that is where the similarity ends. BJJ practitioners start as white belts and progress to blue, purple, brown and black belt. After attaining each belt, stripes may also be awarded to signify progress and levels of competence. Belt gradings are informal and conservative in nature: belts are awarded at the instructor’s discretion and seem to be heavily influenced by attendance, progress and time spent on the mat. That said, a BJJ practitioner may remain at the same belt level for years at a time. An enthusiastic and avid BJJ practitioner should be able to attain their black belt within 8-9 years, an exceptional student, perhaps sooner. 7. 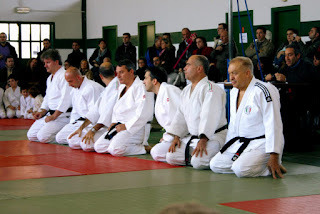 Honorifics: Seniority and respect play a large role in Judo. In Judo, the term ‘Sensei’ is usually reserved for 3rd degree black belts and up, but may be used by colored belts when addressing any black belt. However some black belt instructors prefer to be called by their first name instead. 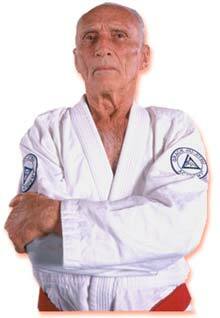 In BJJ, the equivalent of Sensei is Professor and is only used when addressing black belts. The term ‘professor’ has a scholarly overtone and again, is one that the average person can easily identify with. Again, in my limited experience the instructors are normally called by their first names. However, to avoid offense, when visiting any new Judo or BJJ club I would ask the instructor how they prefer to be addressed. 8. Profit vs Non-Profit: As a rule, Judo Clubs are run as non-profit and can often be found in community centre’s, schools and/or rented out spaces. It’s rare to find a Judo Club as a standalone storefront/entity. Unlike Judo, BJJ is for profit and charges accordingly; charging what Judo clubs could and maybe should be charging. 9. Conduct: Judo tends to be formal in its on-the-mat interactions. For example, it is proper etiquette to bow before entering and after leaving the dojo mat area. It is also proper etiquette to bow to your partner before and after a randori (freestyle practice or sparring) and/or ne-waza (ground work/grappling) practice session. 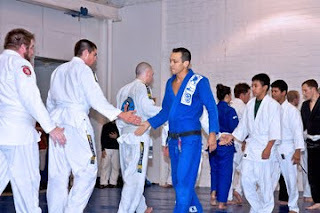 BJJ clubs are less formal and as a rule, emphasize camaraderie more so than formality. For example, prior to and following a practice session (rolling), participants will shake or slap hands. Should one partner submit the other during a rolling session, they will break and shake or slap hands. At the end of the BJJ class, everyone is acknowledged and appreciated for their efforts with handshakes, hand slaps and partial hugs. Note: this is the behavior demonstrated at the BJJ clubs that yours truly has attended and as a result, cannot be verified as common practice among all BJJ clubs. A typical end of class Rei in Judo. BJJ's more relaxed way of finishing a class. 10. Perception: Although an Olympic sport practiced world-wide and over 100 years old, Judo has an image problem. In general, the Judo community has no idea how to market itself. Rather than embracing a resurgence in Martial Arts vis-a-vis MMA and the UFC, Judo seems to have turned a blind eye to the opportunity, preferring to suffer in silence. On the other hand, BJJ is flourishing. It is marketed as a form of self-defense and a staple to any serious mixed-martial artists’ game. No doubt helped in large part by the UFC, Royce Gracie’s MMA legacy and the continued success of BJJ practitioners in mixed martial arts. However the likes of former Judo Olympic Bronze Medalist and current UFC World Champion Ronda Rousey, has started to change people’s perceptions of Judo. I watched an interesting video on YouTube the other night of Ronda training and swapping ideas with Nick Diaz. It also showed Manny Gamburyan (3rd dan Judo black belt) showing Nate Diaz how to throw using Tani-otoshi. It's taken female Judoka, Ronda Rousey, to finally bring Judo to the attention of the MMA world. Great article! I'm a blue belt in BJJ and have been training Judo for the last 4 months - you're spot on with your observations! Good article. I'm conflicted about the choice between BJJ and Judo. I had a head injury fairly recently, and though I feel ok I don't want to risk culmulative damage messing me up down the road. I love judo, but I'm thinking BJJ is probably the safer sport to focus my efforts on? A hard drop on my noggin could spell trouble, I don't know. I've been reading a lot about the long term effects of concussions lately, it's pretty scary stuff. I'm sending this blog to my kindle, looks interesting. Although being dropped on your head is probably more likely to happen in Judo than in BJJ, i'd still say that the chance of being seriously injured is slim. In the 3 years i've been training only two people have received injuries which required medical attention, one was a freak Achilles snap and the other was a broken nose. Why don't you try both out and then pick the one you enjoy the most. No conflict. You could easily suffer a head injury from a bad throw. Do BJJ, far less risk rolling. Nice article!. Their are some interesting differences in the 2 main defining characteristics of each as well, submissions and throws. Due to ever more restricting rule changes, there are now more throws from the gokyo in BJJ than Judo... . Very little emphasis on passivity penalities and "pulling guard" is a very common tactic, although some comps try and discourage it through various point systems. I belive the scissor takedown is illegal in both arts due to high injury rate. "flying submissions" can also be seen in BJJ and Ive been wondering about their application in judo. Whilst Judo once had a much greater variety of submissions, ie leg locks and shoulder locks. They have been ruled out. A funny example is the kimura shoulder lock in BJJ. The Achilles lock is allowed at white belt level in bjj. Spinal locks are generally banned but some competitions do allow them as with the heel hook, a dangerous leg lock. I think a key difference is that you can win by pin in judo, which can de incentivise submission tactics. And that half guard counts as an escape from a pin. You generally wont see scarf hold in BJJ and is even discouraged, due to the easy escape for uke onto your back. A common issue with Judoka in BJJ comps is when they successfully throw an opponent and roll with the momentum. They will get their two points but can quite often end up in a bad position on the ground. However if aware of this, they can appear very dominant from the start of the match. 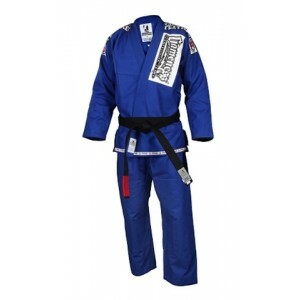 BJJ gi's are generally tapered in the sleeves as well, making them illigal for most judo comps. Your point about BJJ and Judo in MMA is something I've thought about as well and I think the reason we don't see many Judoka in MMA is because most throws rely on the gi. 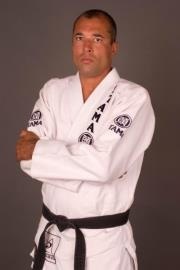 The first person with a Judo background I saw in MMA was Karo Parisian. He was able to incorporate some of the the throws (he caught many opponents with Harai Goshi), but he eventually faded into obscurity. No offense, but what are you doing fighting a Black belt in a tournament if you've only been doing Judo for 4 months?